For years and years now, I’ve been getting up to work out right after waking up. I know myself and if I don’t do it first thing in the morning before I have other distractions like school and work and a life outside of those, the gym is just not going to happen. It may not always be that way, but for now, it’s what works for me. What comes along with that though, is the fact that I’m usually not very hungry when I first wake up at 5:40 AM (yeah, it’s a horribly early time, I know), nor do I want to waste time making food when I’ll just come home after working out to make a full breakfast for myself. When I started working with my new trainer, William Grazione (who’s the bomb, by the way) he strongly advised me to eat before working out so I’d have enough energy to push through workouts. I tried simple whey protein powder mixed in to a glass of milk, but I just couldn’t deal with the sweetness and the consistency that early in the morning, so I decided to get crafty with the protein. What’s easier for me than drinking it, is eating it. 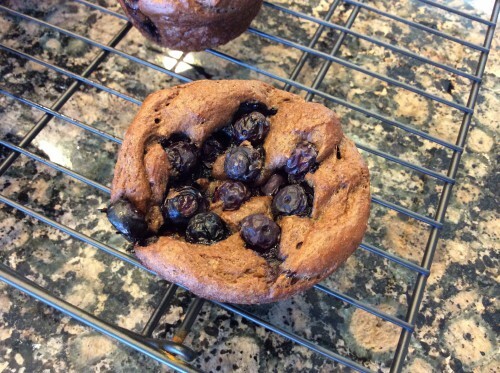 Hence, lovely, portable, high protein chocolate muffins with blueberries thrown in for extra pizzazz. Cook the rolled oats according to package directions. Remove from heat and let stand while you prep everything else. Combine the protein powder, baking powder, baking soda and salt together in a small bowl. Pour that in to a blender. Mash the banana into mush, then add that along with the egg whites and oatmeal to the blender and the dry ingredients. Mix into a smooth consistency – it will be a thick batter. Pour the blueberries into the blender and mix them by hand to distribute evenly in the batter. Spray six muffin tins with nonstick spray and pour the batter (with the help of a spoon) into the tins. Remove to a cooling rack and then store in an airtight container in the refrigerator for up to a week. Now you’re ready with a sweet, go-to snack for the morning or afternoon workout! 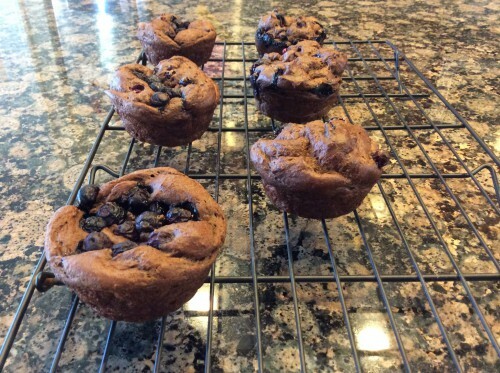 The muffins do lose a little of their fluffiness when they come out of the oven, but the taste is still spot on.